The colour coding system on our labels is to help guide you to the predominant flavour profile of each bean. While we all have a comfort zone, we encourage you to explore and try something different. All orders have to be placed by 8 pm on Monday or may fall in the next week's roasting schedule. Will be shipped by Wednesday. 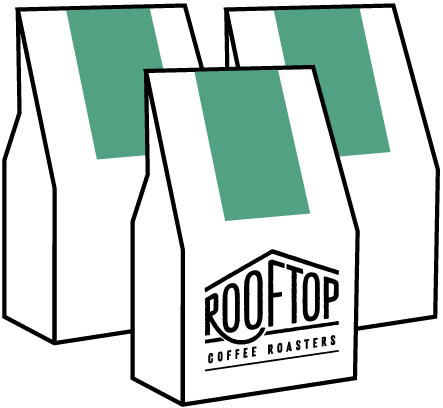 A Rooftop coffee subscription is a great way to try out all our different beans. We’ll send you a different selection of beans upon each delivery: to brew as either drip, espresso, or a combination, with or without decaf. Choose either 2 or 4 bags, delivered to your door once or twice a month, for a prepaid period of either 3 or 6 months. Your subscription payment includes shipping within Canada. We welcome your feedback and will endeavour to provide you with coffee that you love! We currently offer shipping within Canada and the US only. Different shipping rates apply to the US. Is this subscription a gift for someone? Please email us at: contact@rooftopcoffeeroasters.com and let us know who the recipient is, their address, and when you’d like the first shipment sent. Receive a combination of single origin beans or blends, best brewed as drip, chemex, V60, aeorpress and french press. Receive a selection of our most rich, velvety beans best brewed as espresso. Receive a combination of single origin beans or blends– giving you the ability to switch up your brewing methods. Getting outside and being active is something we cherish here in Fernie. That's why we offer merchandise in both basic cotton and a performance based bamboo fabric by TASC Performance that keeps you warm and dry no matter what you're doing. Perfect for setting tracks up on the mountain and an après ski night out on the town - these are Rooftop tested and approved!